Given an N-ary tree where every node has at-most N children. How to serialize and deserialze it? Serialization is to store tree in a file so that it can be later restored. The structure of tree must be maintained. Deserialization is reading tree back from file. This post is mainly an extension of below post. In an N-ary tree, there are no designated left and right children. 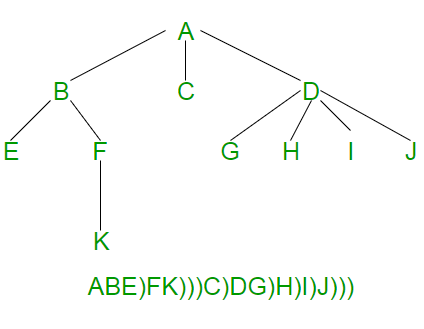 An N-ary tree is represented by storing an array or list of child pointers with every node. The idea is to store an ‘end of children’ marker with every node. The following diagram shows serialization where ‘)’ is used as end of children marker. // This function constructs N-ary tree from a file pointed by 'fp'. The above implementation can be optimized in many ways for example by using a vector in place of array of pointers. We have kept it this way to keep it simple to read and understand. This article is contributed by varun. Please write comments if you find anything incorrect, or you want to share more information about the topic discussed above.